Only three reasons? 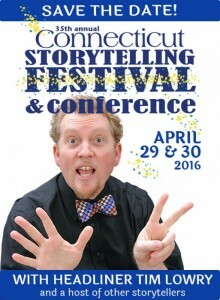 It is hard for me to choose three reasons to attend the Connecticut Storytelling Festival, but here I go. 2.) Workshops, did I mention workshops? There will be many to choose from, choosing is the hard part! I learn something at every one I take. I meet the most interesting people in the workshops. Often I am stretched to think in new ways, to look at age old topics in a new light, to further develop a skill. Workshops, something for everyone! 3.) Community, It is hard to describe but there is a community feeling as the sea of people follow the tides out of one performance and into the next workshop. The buzz in the air of excited conversations is electric. One table will hold a cluster of educators there to learn how storytelling impacts literacy. Another table a couple of storytellers sit close catching up on performance and family news between events. In the hall old and new friends slowly meander the tables of vendors wares offered. Music seeps from one room and draws late comers to the door and into the seats at the back of the room. People sway and sing along, or are swept away in the mood of the music and story, they look to one another, those they shared the magical journey with. Would you like to be my guest? Do you want to come to the festival and enjoy performances, workshops, socialize, visit the vendors and silent auction? Would a weekend to learn more skills to use as a museum docent help you? Are you a classroom teacher wanting to use story in education? If you have never been to the Connecticut Storytelling Festival held at Conn College in New London, CT. this is your chance. In the comments area tell me why you want to go. I will be choosing one person to visit the Connecticut Storytelling Festival as my guest. It might be you! You might become a part of the community, take a workshop, enjoy the performances and soak up all that Storytelling has to offer. I will make my decision on March 1, 2016, register today I can always refund your fee.